Imagine you’re sitting in the driver’s seat of a car. You turn the engine on. The dashboard in front of you immediately lights up, showing you your gas mileage, any engine lights, and the speedometer. Now think: what if these buttons and signs were somewhere else? Say, the speedometer was located on the gear shift, and the gas mileage was located on the passenger’s seat – driving would truly become a mess. Having these crucial elements on a car located in one simple, go-to location makes the whole experience safer and efficient. Now think about the data silos you have in your business and the extreme lengths you’re taking to pull the information and data you need for your projects. Before you know it, you’re spending all your time collecting data and far less actually using it. Truth is, there are large sources of valuable data out there that you can use, but it’s scattered throughout various spreadsheets and databases. Even the reports you pour hours into creating – people sometimes don’t end up opening the files to view them. On top of that, you get the same questions from directors and executives about one metric or another, for which the answers could be found in the periodic report you send out. What if you had a data dashboard for your business, like a car? With the help of an interactive data dashboard, you would find a way to share valuable information via the web and provide visuals for users to better comprehend the data. This would also give them the option to drill down to deeper levels of data, if they needed to. Also, with the right solution, you wouldn’t be responsible for updating this dashboard regularly! The dashboard could be connected to live data, making it free of human intervention. Finally, if there ever came a time where you need to make changes to the pre-existing business dashboard, or create a new one, it’ll be easier to do so WITHOUT requiring IT’s help! Here’s the scenario: you have useful data, but you need to find a better way to communicate it to your coworkers. You need a way to securely log in to a web-based dashboard and see the information you need concisely. You want to give live data to executives, customers, and other business users so they have the ability to see key performance reports and metrics whenever they want, and give them the option to dig into the data for a more in-depth analysis. By having a web-based business data dashboard, you would be better able to integrate various sources into ONE single view. But there’s one, maybe two things holding you back. Time and cost. Sometimes it seems status quo is the easiest option to take, regardless of the benefits of bringing in a business dashboard solution. Are you itching to get started on building your very own business data dashboard? Look no further – Yurbi is here to help. Yurbi provides a seamless web solution that integrates dashboards, security, report building and so much more! Yurbi combines visualizations and data from any number of databases and/or imported data to provide real-time access. Users are able to view live data streams from their desktops, tablets, or mobile smart-phones desktop browsers, without needing to install any kind of special software. 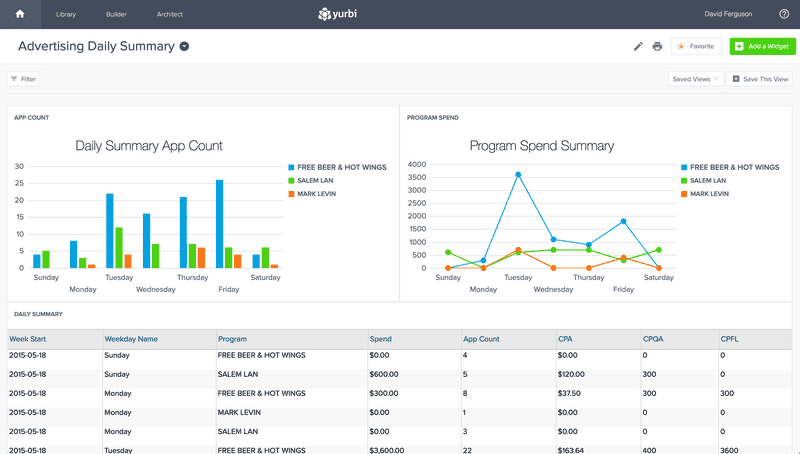 And the reason we call it Yurbi, or “Your Business Intelligence”, is because end users can personalize their own data dashboards by creating filters and saving them as views to quickly see the data displayed by the slices of information they need the most (for example: locations, time ranges or specific customers). The best part? Yurbi doesn’t cost an arm and a leg like other dashboard tools and creating and deploying dashboards takes a mere number of hours, not weeks! How Will Your Company Look After Deploying Yurbi? After deploying Yurbi dashboards in your business, you’ll almost immediately see the results! Users will begin to focus more on data to drive the business, rather than tracking down data. They will be able to dive into more detail from a quick glance at the dashboard, as key data would be available to them real-time from any browser. Users will also be able to keep track via visualization on all key metrics and trends. Finally, from the amount of time saved from manually creating reports, users will be able to spend more time on valuable and time-sensitive projects. The business will run faster and smoothly, making the team, customers and boss happy. Learn more about Yurbi! Contact us to discuss your requirements and how Yurbi can help.